A silversmith is a craftsman who crafts objects from silver. 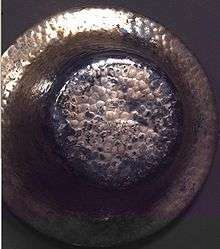 The terms "silversmith" and "goldsmith" are not exactly synonyms as the techniques, training, history, and guilds are or were largely the same but the end product may vary greatly as may the scale of objects created. However most goldsmiths have also worked in silver although the reverse may not be the case. Silversmith is the art of turning silver sheet metal into hollow ware (dishes, bowls, porringers, cups, candlesticks, vases, ewers, urns, etc. ), flatware (silverware), and other articles of household silver, church plate or sculpture. It may also include the making of jewelry. In the ancient Near East the value of silver to gold being less, allowed a silversmith to produce objects and store these as stock. Ogden states that according to an edict written by Diocletian in 301 A.D., a silversmith was able to charge, 75, 100, 150, 200, 250, or 300 denarii for material produce (per Roman pound). At that time, guilds of silversmiths formed to arbitrate disputes, protect its members welfare and educate the public of the trade. Silversmiths in medieval Europe and England formed guilds and transmitted their tools and techniques to new generations via the apprentice tradition. Silver working guilds often maintained consistency and upheld standards at the expense of innovation. Beginning in the 17th century, artisans emigrated to America and experienced fewer restrictions. As a result, silver working was one of the trades that helped to inaugurate the shift to industrialization in America. Very exquisite and distinctly designed silverware, that goes by the name of Swami Silver, emerged from the stable of watchmaker turned silversmith P Orr and Sons in the South Indian city of Madras (now Chennai) during the British rule in 1875. In Ethiopia the trade of silversmith was practiced by the Jews of Ethiopia, otherwise known as the Falasha Clan. The activity was considered (by whom?) to be inferior to others, as reliant on manual skills. Silversmiths has to know how to make silver and has to be strong. After forming and casting, the various pieces may be assembled by soldering and riveting. Silversmiths may also work in copper and brass, although this is usually confined to practice pieces due to the cost of the metals. ** Garrad & Co. was founded by George Wickes in London in 1722, and is still operating. ↑ Jack Ogden. Ancient Jewellery. University of California Press, 7 July 1992. Retrieved 10 April 2012. ↑ Brain, Charles. "Pickling Notes". The Ganoksin Project. Retrieved 15 June 2013. ↑ Kelly McRae. "Trade Secrets". Western Horseman Magazine. ↑ Claude Blair. The craft of silversmith. The History of Silver. p. 225. ISBN 1-85501-900-0. Stamped silver button, made 1787 image from Victoria & Albert Museum jewellery collection.